I thought I might start this thread. So I took my first SCT ride today. S60 from Port Jeff RR to Stony Brook. 8AM, Orion 7 1060 (or 1067 I don't remember). -Bus stop at Port Jeff had no sign, I only knew it was a stop because of benches and a waiting passenger. -S60 came north, made left on Wilson St, only to come back out of Port Jeff Plaza. Bus schedule only shows it dog-legging on Chereb Ln? -Ride was quite fast, despite a detour due to a downed pole in Setauket. Practically nonstop between Port Jeff village and Setauket. -Ridership was moderate. Maximum load that I saw was probably around 10. -An S58 signed Middle Island passed when waiting at Port Jeff, and my bus passed it on layover at 25A. I've read that SCT doesn't do crazy interlining, so what's the explanation? SCT does have some good fareboxes, the main advantage being that they accept dollar bills in my opinion. For your first SCT ride, did you enjoy it? Did the timing and where you were headed, or your plans, work out? Also, good idea to start this thread. I pinned it. Well, I had to be at Stony Brook by 9am, the train got there at 7:46 and the next one was at 9:43. So I just took the first train to Port Jeff and SCT back to kill time. The scheduled 5min connection was more like 7-8min between the slightly early train and slightly late bus so I didn't have to run. The seats were also a lot more comfortable than NICE's. Also it was my first time on a <40ft transit bus (excluding cutaways). I paid a $3.75 fare on the Pittsburgh farebox type pictured last year. It wasn't easy, it timed out a few times as I tried to stick bills in at the right angle with one hand holding luggage. How do the suffolk county transfer and farebox look like again? When I rode it I was in a rush. If the bus had two windows before the rear door then it was a 35ft bus which 1060 is, if it had one window then it was a 30ft bus. If your talking about the bus stop right next to the LIRR then something must have happened to the sign because there was always a sign there before. The map on the S60 Bus schedule is years old, the current way the S60 gets to Port Jefferson Plaza 'S60 came north, made left on Wilson St, only to come back out of Port Jeff Plaza.' was implemented in the late 90's. The S60 to Smith Haven Mall and the S62 Riverhead use to cut behind the Port Jefferson Shopping Center but either Ride Aid or the old Thrift Store complained because the buses were interfering with them getting deliveries. Ah so you rode the S60 during the detour, how did the Detour go? Are you sure the sign said S58 and not 5A, because the 5A runs between Port Jefferson and Middle Island. Unless the driver punched in the wrong sign code. Some times the farebox generates a transfer on its own, I remember it happened on a bus I was riding on a few years ago. The transferboxes sometimes have trouble though. The detour was smooth, traffic was very light. No announcement. Clever Devices still worked past detour zone so its GPS based and not wheel rotation based. I am sure the sign said S58, as I also thought it was a 5A at first. The bus was empty. 5A service at Port Jeff doesn't begin until 8:40 anyway, 30min after I left. The accident happened early in the morning and was mentioned on the news, so my guess is that people probably heard about it and used an alternate route which was why traffic was light. Though I wouldn't say that part of 25A is that busy anyway. Yeah I have no idea how those Clever Devices work, once a few years ago I remember a few years ago I saw a driver pressing a keypad before the Clever Device went off. I meant to say where did the bus turn to start the detour? Hmmm, either the the 5A came in early and the driver punched in the wrong code, or some other driver was running early and was either playing with their sign or punched in the wrong code since the S58 doesn't service Port Jefferson. It's likley that another bus was running early, since If I remember Correctly the S60 to Smith Haven Mall is the only bus in the Port Jefferson area at that time, or at least thats how it was when I was younger. Right at the closure limits. Came out by a fire house? So SCT has Cubic fareboxes now? I predict Smartcards in the near future. You may predict it, but I don't see it happening, a addition, if it could be added to the current farebox system, or a change for that would cost money and the county doesn't have that type of money. Heck the county has a deficit, that is why the County Executive is using the rest of the state aid and I believe federal money that isn't going to be used to add Sunday service and expand hours on some routes to paying for the county's contribution for the system. News to me, as I thought they had GFI's this whole time. And smart cards would be nice. Is that so? Interesting, as I thought Cubic only fairly recently entered the farebox business. Thanks for the fill in. And perhaps, but if the MTA and other regional agencies hop onto the smartcard system I'm sure SCT wouldn't hesitate. It could be cheaper than what's offered now if done right. As far as I know SCT has always had GFI fare boxes. I haven't heard of any changes to the farebox, and I haven't had the need to take a bus for a very long time so I wouldn't know. 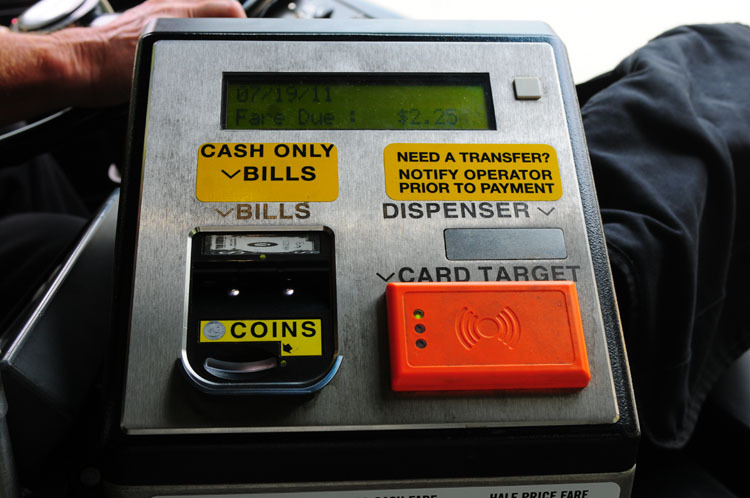 I'll ask a friend to see if SCT changed fareboxes. I'd be surprised though if they did since the companies had trouble getting the GFI's from the retired buses into the Orion VII's. The GFI's kept blowing the fuses or causing some type of problem when they were getting installed. Suffolk Transit still uses GFI Genfare boxes. And they do have their fair share of problems with them, its usually the thing that prints out the transfers. Yeah those transfer machines have always had trouble since basically the day Suffolk first got them. The last time I heard about a problem with a farebox was a week or so ago, and what ever the problem was with the farebox also effected the transfer machine, which is I believe the first time I heard of that happening. Normally its either a stand alone problem with the fare box or transfer machine. Though whatever the problem was had been a quick fix since the bus was used the next day. 1056 has had that ad for about a year now, it's the only bus I know of in the SCT fleet with a back ad wrap. Suffolk has wrapped some buses with a back wrap in the past, I know 9908 had one many years ago. I saw another one with a back wrap but didn't take a picture of it, it was an old Gillig. I think that Gillig slipped my mind. I believe it was one of the Gilligs that was formerly assigned to Inter-County Motor Coach, now EBT, but I can't off hand remember the bus number. Or at least I am aware that at least that they had a Gillig with a back ad wrap. I didn't of course see it in person, but I swear I saw a picture of it. Ironic, advertising advertisement opportunities. Must be a comeback. That's mac's website (mac5689 on the forum) if you wanna know who runs it. Yeah that has good stuff in it, he's really the only person that keeps everyone on tab with suffolk transit's history, as he lives there. Thanks, I know the history because I've ridden the system since I was born, before that even if you want to get specific, though I haven't had a need to as of late. Also my Grandfather use to drive for one of the companies that contracted with the county though after 1968 he mostly drove for the companies school bus operation. wow all I have to say great website!